Mary Shipp is the author of several needlework books, as well as a designer and teacher. Her most recent book is Design for Embroidery; she is also the author of Color for Embroidery and several books on various embroidery techniques. These volumes have established her reputation for clear diagrams and good verbal descriptions. Mary's objective as a teacher is to develop materials that will encourage students to experiment with color, thread and stitches, and discover that they, too, can create needlework designs. Out of her teaching materials have come a number of smaller booklets, one of which, Stitching with Overdyed Thread, features various variegated threads from The Caron Collection. We urge you to support the designers who are contributing the outstanding free classes and features you see at this site. Click here for information on ordering Mary's books and booklets. In Part One of this two-part article, which appeared in October, l999, we learned a few basic color terms and discussed the traditional color chords or color harmonies. We proved that theoretically all colors "go with" each other, and I made the statement, "...every color 'goes with' every other color, as long as you have a pleasing combination of hues tints, tones, and shades." Before we discuss color contrast, which is really all about combinations of hues, tints, tones, and shades, we should take a little digression and look at the two types of tones. Earlier I mentioned that some color writers do not even use the term "tone", which refers to a color that has been adulterated either by gray or by the color's complementary color. I said that not only did I prefer to use this term but that I felt that the difference between the types of tones was important enough to make the distinction. In the illustration at the right, I have taken the six primary and secondary colors and added white to create tints, black and white to create grayed tones, the complement of each color to make complementary tones, and black, to make shades. In each case, I have added the same amount of the adulterating color(s) to every hue. As you see, adding a small amount of black, for example, makes a great difference to the lighter hues such as yellow, and very little difference to a darker hue like blue. Darker colors have more tinctorial power than light colors. This is a fact that dyers have to remember; those of us who do not work dyes can merely register the information and move on. Now let us compare the two types of tones. For the grayed tones I added a small amount of black to the color in the tint column. (Each tint already contained white; all I had to do was add the black to create a grayed tone. For the complementary tones I added to red a small amount of green (yellow + blue); to yellow I added a small amount of violet (red + blue); to blue I added a small amount of orange (yellow + red), etc. Notice that in each case, we end up using all three primary colors in each complementary tone. The ultimate version of this type of addition is shown below; when we add equal amounts of all three primary colors, we create gray. In actual practice using dyes instead of colors on a computer screen, the complementary tones often come out looking somewhat brownish. There are some lovely and some decidedly unusual looking colors in this group of tones. Observe, for example, what happens to a tint of violet when it is turned into a complementary tone. These colors are often more lively than the grayed tones. Generally speaking, people either love these complementary tones or they hate them. Most of us do not dye our own thread, so much of the discussion in this article may seen pointless to you. "I don't mix colors," you may say. "What does this have to do with me?" In addition to Lois Caron's discussion of optical mixing (to be found in the archives), consider the "in between" areas on your favorite variegated or hand-dyed thread. Here, in areas where purer colors blend together, one often finds tones. When I am designing a color scheme using variegated or hand-dyed thread I often can match this tone to a solid color from another type of thread. This gives me a totally unexpected color to use in the composition, and this unexpected color is often the one that gives the composition that special little kick that raises it from a so-so color scheme to something special. Before we move on to backgrounds and contrast, I urge you to collect as many gray threads as you own, and place them side by side. You will be amazed at how different they appear. This is because some of them contain a tiny bit of red, or yellow, or blue, and some were created using only a dilute black dye. These latter are the true neutral grays; the others are not. See the examples at the right. We need to be aware that gray thread is not always pure gray, when using it in a composition. If you don't like the way a particular gray looks in a design, try a different family of grays. We will ease our way into a discussion of contrast by looking at backgrounds, which are much more important to a piece of embroidery thanmany stitchers realize. What is contrast? Contrast means difference. To have contrast, or difference, you must have two things to compare. In the lavender rectangle, there is no contrast of any type. There is contrast between the lavender rectangle and the background of your computer screen, but that is not the issue here. In the examples at the right, the same design is shown against a white and a neutral gray background. The colors in each design are exactly the same. We are talking here about contrast between the background and the colors in the design. Within the design itself there is plenty of contrast. There is a great deal of contrast between the design and the white background; some people might feel that there is too much. Against the white background the colors seem strong and vital; notice how much softer they seem against the gray below, although the colors in the design are precisely the same. The gray background, since it is very light, provides some contrast with the colors in the design, although the colors appear subdued against the gray as compared to the way they look against white. Against the black background shown at the left below, while the overall composition is very dramatic, the hue of blue violet is lost because there is not enough contrast between the blue violet hue and the black. If we are dissatisfied with the way our chosen colors look against a particular background we can change one of two things, the background or the colors. We might guess that using a darker gray (center above) would brighten up the colors, but notice what happens when the gray background is darkened. This is not a successful change, because the colors fade even more than they did against the lighter gray. If we want to use black for the background, we will have to lighten some of the colors. They can be easily modified as shown at the far right, where both the hue and the tint of blue violet were lightened. Next we look at examples where the backgrounds are respectively pale tints of yellow green, blue violet, and red orange. The red orange closely approximates ecru fabric. Many stitchers like to use colored backgrounds, though others prefer neutral colors (white, gray and black) or very pale earth tones, such as ecru, ivory or beige. This is a matter of personal preference. If a colored background is chosen it must be light enough to provide good contrast with the colors in the design. Notice in the row immediately above what happens when a darker tone of red orange is used in the background; on the left, the red orange tint in the design is lost; in the center example, the middle value colors have been lightened to contrast with the background. The dark colors already contrast well enough. In other compositions, the background fabric may be much darker than the threads used. This type of design is akin to a photographic negative, and can be very dramatic. In any case there must be considerable contrast between the design and the background. See the final example above. In all of these examples we have been talking about contrast of value, or contrast between light and dark. The design itself has contrast of color, and was created to have enough contrast of value within itself. In addition to contrast of value, there are other types of contrast to be considered when coloring a design. They are, contrast of hue, contrast of intensity (saturation), contrast of extent, and contrast of temperature. Some authors mention complementary contrast plus simultaneous and successive contrast. Complementary contrast, in my opinion, is sufficiently covered by contrast of hue, and successive and simultaneous contrast are very technical and beyond the scope of this article. This leaves us with five types of contrast, shown in bold face type in this paragraph. Each of the examples given at the right show one or more types of contrast, as pointed out by the captions. Not every design contains all the different types of contrast. Generally we try to emphasize one or two of them. Some of the others will sneak in through the back door. Contrast of hue is obvious in the second example, where blue violet is paired with its complementary color, yellow orange. The complementary color chord will always give you the greatest contrast of hue. This is why I feel that complementary contrast is nothing more than a special case of contrast of hue. The design also has contrast of value and contrast of saturation. Since the next example is a monochromatic design, there can be no contrast of hue. Contrast of value and contrast of saturation are present however. Different intensities (saturations) of blue violet create the contrast of value (lightness/darkness). Compare this with the next example, which is made up of a high value hue (yellow ) a medium value hue (blue green) and a low value hue (blue violet) all of which are, by definition, fully saturated. There is no contrast of saturation, but there is contrast of hue and contrast of value. The design is also very garish, which is no surprise, because of the lack of tints, tones, or shades. Thus far we have covered contrast of value, hue, and of saturation, and we have created some very different effects in the same design. If we like bright pure colors we can use hues and tints, as is shown in the design at the left below. If we like really subtle effects, we can try complementary tones, as shown in the center. If we like drama, we can contrast hues and/or tints and shades, as shown at the right. This is what is meant by "a pleasing combination of hues, tints, tones and shades." Remember, it has to be "a pleasing combination" for you, not for someone else. There are two types of contrast remaining, contrast of temperature and contrast of extent. Contrast of temperature is dependent upon hue. In simplified terms, the warm colors are red, orange, and yellow, and the intermediate colors in between, and the cool colors are green and blue and the intermediate colors between them. What about violet? Well, that depends on the company that violet keeps. In the examples below, the violet rectangles are exactly the same color. To me, the one next to the yellow rectangle looks cooler than the one next to the green rectangle. This is quite subtle, and you may not agree with me, which is just fine. Comparing color temperature is a very subjective thing, and in the long run, when people disagree it is nothing to worry about. The design at the top right has considerable contrast of temperature, since it is made up of tints, tones, and shades of the hottest color and the coolest color on the color wheel. Contrast of temperature is important when a design is too cool, or too warm. Once again, this is to a large extent a matter of personal preference. The second and third designs are very similar. In the top example of this pair, the violet "warms up" the design to quite an extent. For some people, or for some uses, this might be considered "better" than the other one, where the cool colors are unrelieved by any warm colors at all. Other people might fall madly in love with the lower design, or they might prefer it under certain circumstances-for example on a pale lemon colored wall. The final type of contrast we will cover here is contrast of extent. Extent has to do with balance, and emphasis, two other components of design. While we are talking more about color theory in this article than we are about design theory, we know that these two branches of art have to work together to create an attractive piece of needlework. Extent refers to the amount of area covered by each color in the design. Extent is difficult to calculate in any design that deviates from a checkerboard, especially when the intensity of the various tints, tones, and shades of the various colors come into play. According to one early color theorist, if it was necessary to rely on mathematical formulas to insure that a design was balanced, one should do so. Fortunately, that is an outdated notion in most design circles. Not every design needs to be balanced in the first place, and if we do want balance, we can rely on our eyes, rather than algebra, to make it so. The next two designs exhibit non-balance (the upper one of the pair) and near-balance. The difference is that in the top one there is greater contrast of extent, which creates the lack of balance. There is much more design area covered by various tints, tones and shades of red orange than there is of blue green. In the lower one, the areas covered by the two colors are closer to equal, so that there is less contrast of extent, and more balance. Note how fragmented the lower of the two designs appears. This is a difficult design to balance for extent, especially with these two colors. Please remember that all of the various color treatments you see in this article and the previous one are purposely exaggerated to emphasize a particular point. Not all of them are what I would consider attractive compositions. We use contrast of extent as one way to establish an area of emphasis. Remember that contrast means different. In a design, the area that is different in some way will be the area that attracts people's attention. With regard to color, this is the area that is the brightest, the lightest in a dark composition or the darkest in a light composition, the warmest in a cool composition or the coolest in a warm composition, etc. Now analyze an outline version of the design we have been using in this article. It is a stylized plant with a flower. One assumes that the flower is to be the focal point (area of emphasis); this is what we might call a context clue. When we look at the design, we see that most of the lines flow generally upward; they carry the eye toward the flower, which is the highest point in the design. Additionally, this is the only flower in the motif, while most of the other shapes are paired on either side of the vertical center. Because of context (the ultimate purpose of a flowering plant is its flower), height, uniqueness, and direction of line, the flower stands ready to receive the most attention-getting color in the design. We have done this in the first colored example at the right. The color here is lighter and warmer than the other colors. Two lines of the same color lead our eye more up than out. The design is in harmony with itself. Now look at third illustration. As mentioned earlier, fragmentation, as evident here, does not help us understand a design. We have three colors, scattered in various places. The blue is especially fragmented, and the brightest blue is at the bottom, which pulls the eye away from the flower rather than toward it. If, for all the logical reasons listed in the paragraph above, the flower is the area of emphasis, why is the brightest, most attention-grabbing color in the design at the bottom of the plant near the roots? Here color does not reinforce the area of emphasis, it distracts from it. The composition is less successful because of the lack of a coherent area of emphasis. In the first of these two articles about color for needleworkers, I demonstrated that there was no "magic formula" or set of rules that governed color combinations. Just as in a rainbow, all colors are in harmony with each other. The rainbow is the source of all hues. A rainbow, however, is appreciated for its rarity. A successful design of pure hues is also rare. 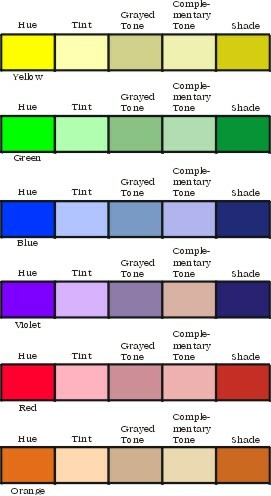 In real life and in needlework design, we tend more often to use tints, tones, and shades. Contrast between hues, tints, tones, and shades is an important factor in the application of color to a design. There are many types of contrast; they vary in their importance in a particular composition. In the past two or three centuries we have moved from a set of rules and formulas with regard to color to an appreciation of color in all its forms. It is appropriate that as we close this century and look ahead to the next we realize that personal preference, as opposed to someone else's opinion, should be the determining factor when choosing color for a composition. My short way of saying this is, "If you like it, use it." If you do not like it, but are not sure what to do to fix it, a little knowledge of color theory comes in very handy. This is when modern-day color theory comes to the rescue. Other than that, enjoy the world of color, as opposed to worrying about breaking the rules. Mary Shipp teaches at EGA and ANG Guilds, needlework shops, the Rockome Illinois Cross Stitch Festival, and other needlework events. Her main occupation is as an author of self-published books on needlework, and of design booklets. Her books, listed below, are available in needlework shops. Shop owners may contact her at Stitches by Shipp, 7426 Fish Hatchery Road, Bath, NY, 14810. (607) 776-2759, wholesale inquiries only, please. Retail customers whose local shops do not carry Mary's books may call The Golden Unicorn, Corning, NY (607) 776-2759; Stitchery Row, Endicott, NY, (607)748-8003; Ellen Nell, Inc., Winston Salem, NC (800)499-1224; Ruth Kern Books, Phoenix, AZ (606) 943-0738, or Hard-to-Find Needlework Books, Newton Center, MA (617) 969-0942. All of these firms ship mail order and do charge orders. Stitches for Counted Thread Embroidery, 1995. A two-volume stitch encyclopedia, describing over 250 stitches in clear, easy to read format. 626 pages total. Sold only as a two-volume set, $64.75 per set, plus postage. Color for Embroidery, 1997. This book contains two sections, Part 1, a discussion of color theory in general terms with color illustrations. Part 2, color theory as applied directly to embroidery, with detailed examples. 130 pages, $49.75, plus postage. Exploring Pattern in Stitches, l997. Presents a discussion of techniques used to develop diaper and other all-over patterns in any counted technique. Includes over fifty sample patterns with variations, plus a short discussion of color. 87 pages. $26.50, plus postage. A New Look at Blackwork, 1998. Chapters on several Blackwork techniques, as well as the history of Blackwork. Over 25 different stitches used in Blackwork are clearly and comprehensively diagrammed. Directions for 5 different projects are included, plus many diagrams and pictures of actual stitched examples. 102 pages, $27.50, plus postage. A New Look at Borders and Bands, 1998. Discusses the component parts of a border and how they work together to make a well-designed whole. Turning corners and making a border fit into a predetermined space is covered, as well as the use of various stitches, color, and texture. 61 pages. $26.50, plus postage. Design for Embroidery, 1999. This book is the companion to Color for Embroidery, although it may also stand alone. The first two parts of the book cover the elements and principles of design. The final part shows how to apply design theory to embroidery. Color and black and white illustrations, a glossary of terms, and several specialized bibliographies are included. Completely indexed, 150 pages. $49.75, plus postage. Stitching with Overdyed Thread, 1998. This is a 30 page booklet, as opposed to a book. It is full of color pictures showing experiments to teach you how to get the most from variegated threads of any type, and covers a number of different stitching techniques. Includes two projects, with stitch diagrams for all stitches called for. $19.95, plus postage. Other booklets: At the present time, Mary has a total of 20 booklets available, ranging from "How to Do Cross Stitch" and "Stitching on Linen" to a reproduction of an 1808 sampler, and a Florentine Stitch pillow. For a color catalogue of all Mary's publications, send a check for $3.00 to Stitches by Shipp, 7426 Fish Hatchery Road, Bath, NY 14810. Your $3.00 will be refunded with your first $20.00 order. No phone or charge orders for catalogues, please. COPYRIGHT NOTICE: This feature is for the personal use of our web site visitors only. No part of this feature story nor the included designs can be reproduced or distributed in any form (including electronic) or used as a teaching tool without the prior written permission of Mary Shipp.